* The prices that you see is what will be charged to your credit card, taxes, delivery and pick-up are included; Per each additional day after 7 days of rental add $13.00. LAS VEGAS SCOOTERS protection plan is optional. This scooter is the 2017 GO-GO ELITE TRAVELLER PLUS HD an extra light weight portable scooter with a greater weight capacity than the regular go-go elite traveller. This is a really nice tiny scooter, recommend for people from 220 lb to 290 lb, that are looking for something extra light weight and portable, or just want to cruise Las Vegas strip with style. 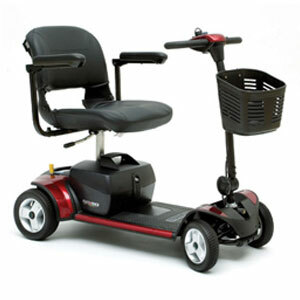 With this scooter you will be able to get around in tiny spaces in casinos, hotels, malls, buffets, etc, without taking a lot of room like the other old-fashion inexpensive scooters with high-back and head-rest, and a huge metal bumper which will make it hard getting around because the bumper can get’s stuck in the wall elevators, corners, chairs you can even hit someone. Plus the useless high-back and head-rest will only decrease your visibility especially in this crowded touristic city, where you want to be able to see who is behind you when you are backing-up. This scooter is the best in this category with a max speed of 4.5 mph, and battery range between 8 to 12 miles. You don't need tools to disassembly the scooter and in less than 1 minute you'll have it in 4 extra light-weight pieces (heaviest part weighs only 33 lb ) and take it anywhere you want even in a taxi-cap, with the other old-fashion inexpensive scooters you will need a handicap taxi-cap, that may take hours to get there and you may end-up over paying, so keep in mind "get for what you pay for ",we are proud to be the only company in Las Vegas where you can choose and reserve your scooter by model, and we only use modern state-of-the-art easy to maneuver scooters made by pride.